After what felt like an eternal winter, spring is finally here fashionistas! Yes its true New Yorkers did get a few inches of snow on the very first day of spring. Nevertheless we are glad that spring fever is officially here and what better way to liven up the new season’s wardrobe then with a little sparkle. Today we are very excited to introduce you to Bling Jewelry and share product reviews for three items right from their online store. This fashion jewelry company was founded in 2008 by Elena Castaneda and is currently thriving with an array of affordable styles for men, women, children and includes costume jewelry as well. When Bling Jewelry contacted One Style at a Time for a collaboration we couldn’t be happier after seeing the variety online, not to mention their prices for so many pieces are very affordable. Something that did catch our attention is their Bling inspiration collections which include theme categories like Miss Timeless, Hopeless Romantic, Animal Obsessed, Modern Muse and City Chic. With all that said, lets move on to the three products we selected for this product review. First up we have the Golden Eye Bracelet from their Spiritual collection which currently retails at $44.99. From the online image it looked like the eye design might be a bit oversized but in fact its the opposite. It was a pleasant surprise to see that the bracelet in its entirety is very light, dainty and delicate. 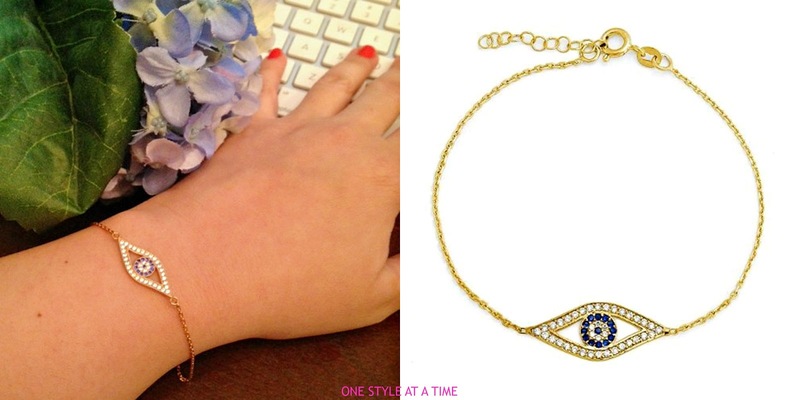 The evil eye includes a dazzling blue and white cubic zirconia with a gold chain. The only slight negative would be the size of the bracelet which is 7 inches in length but might run a bit on the small side for those with a larger wrist size. Otherwise, the bracelet makes for a great lucky charm or gift to ward off some of the world’s unwanted evil. Next if you like soft pink hues and a touch of vintage then here’s something to consider, the Rosy Outlook Earring. 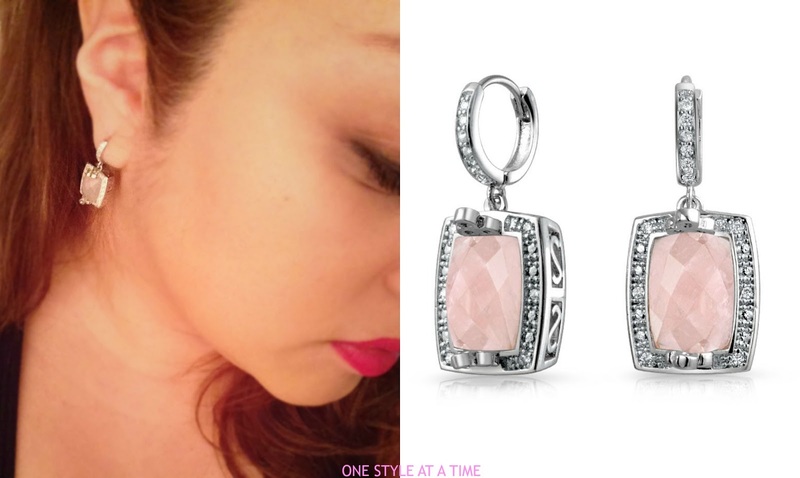 This vintage style simulated rose quartz, cubic zirconia detailed dangle earrings is brass and rhodium plated. They have just enough charm to wear for special occasions and it sells for $39.99. The only concern was the lever back closing which was a bit small and took a little maneuvering before getting it on and closed. Once in place the clasp was secured. I would just suggest that they make the lever back opening slightly wider to accommodate the pierced earlobe more easily. Beyond that I was quite pleased with the weight, all around detailing and look of this pair of earrings. You may have noticed that gemstones are a big spring trend in jewelry and this hits the mark! 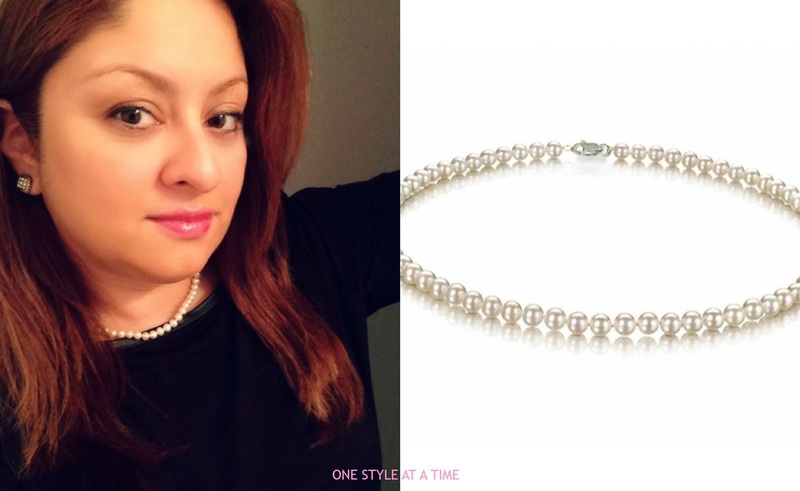 Finally, if you follow me on Instagram you may have already seen me wearing this classic snow white pearl necklace from Bling Jewelry’s Miss Timeless inspirational collection. When you first see this necklace it would be hard to believe that it is only $39.99. Every woman needs to make that classic statement and channel her inner Jackie O. If you have any spring weddings, showers or special spring events on the horizon, this is a great buy ladies. What can be more classic than a single strand of pearls. With Mother’s day right around the corner this might be a nice surprise gift. One Style at a Time Overall Review: If you are looking for affordable, fashion accessories that brings today’s fun trends with classic favorites then Bling Jewelry is well worth a visit. One Style at a Time Final Score: Out of 5 hearts we give Bling Jewelry 4 golden hearts! Disclaimer: I received all three pieces of Bling Jewelry for the purpose of this review. All thoughts are my own.